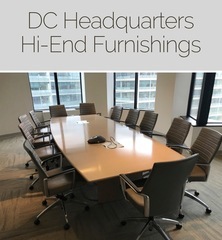 M21799 National association headquarters is doing a multi-floor restack and will liquidate high-end contemporary offices, workspaces, conference and common area furnishings and decor. Relocated to Sterling for easy removal! AUCTION CLOSING DATE: Friday, October 26th, beginning at 11:07 am. Bidding closes on the first item at 11:07 am, then closes at the rate discussed in these Terms and Conditions of Sale. (a) Staggered Closing: This online auction will generally begin to close at a rate of ten items per minute, every minute. Items’ closing times will be displayed on the website but may be extended past their scheduled closing time, as a result of the Auctioneer’s dynamic closing feature. (b) Dynamic Closing: The closing time of an item is generally extended an additional one minutes whenever a bid is placed within the one minutes leading up to an item’s scheduled closing time.